Last Monday I got the chance to participate in another of Fox’s conference calls, this time with the executive producers and writers of Fringe, Jeff Pinkner and J.H. Wyman. 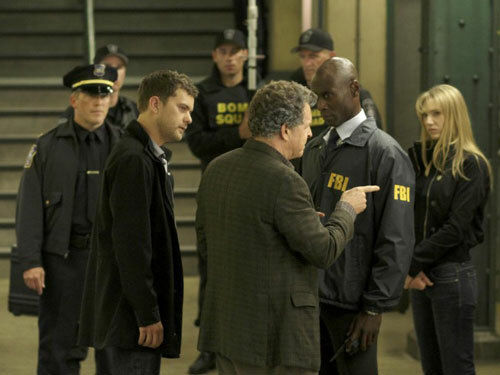 I’m so looking forward to this new season of Fringe! I loved how last season ended and am really curious to see what direction the show will go. It might be a bit obvious, but BEWARE SPOILERS for previous seasons and general sneak peeks of the upcoming season. Q: The episodes, I heard they’re going to alternate from one week taking place over here and another week it will be over there. Is that true? J. Pinkner: It is true. What we’re really excited about as this season gets underway, is that we have left our heroine on the other side, what we refer to as over there, the alternate universe. Our universe being over here. We thought that the best way to thoroughly tell these stories was to dive into them wholeheartedly. So an entire episode will take place over there with the alternate Fringe team and then another episode will take place over here. 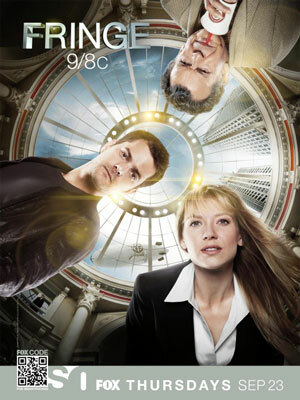 Rather than trying to tell an episode that takes place in both universes simultaneously within the same episode, we wanted to thoroughly explore a Fringe case over there and the journey that our heroine is on and then come back over here because the character that we refer to as Bolivia, or short for Bad Olivia, is here embedded in our team. We have point of view characters in both universes and it seemed to us the perfect opportunity to really explore in a thorough fulsome way the alternate universe. J. H. Wyman: Yes, we just loved the idea and it became apparent to us that we felt that the fans would appreciate a mythology in two places. That gave us the ability to have two shows about one show which you never get the chance to do on television. It just presented itself in such a natural organic way to evolution in our storytelling. Once we got in there we realized it’s great; we can have a fantastic compelling mythology over there and get people invested in that universe with someone at the heart of it that they absolutely identify with and care about and then come back over on this side and have the mythology carrying on here. So we’re excited to see what fans say about that because we believe in it 100% and we think it’ll be a great journey. J. Pinkner: One of the challenges we’ve had is that the idea of an alternate universe is both heavy and intellectual but as soon as you start to experience it you realize that it’s really emotional and easy to grasp. In season one we sort of acknowledged an alternate universe. Season two we visited it. Season three we really want to spend time there and get to know what the conditions are like over there which really just reflects on our own society and what life could be like here in our own world had certain things gone differently. Q: You guys have also said that, obviously Olivia’s going to be over there for a good portion of the season. Obviously Olivia, and Bolivia as you call her, they’re obviously both out of place. They’re going to be working with different team members for several episodes. What sort of dynamic can we expect between all of these characters? J. Pinkner: Last season was about secrets. This season we’re going towards the concepts of duality, the concepts of choice, the concepts of who are we as people. What happens when you make a different choice, those consequences? So as a blanket theme I think self actualization for our characters this year is where we wanted to go and when you start to look at two versions of the same person you can get into some very profound questions and areas that are interesting because you’re going to see someone who is not Olivia dealing with Walter. Somebody who is Olivia dealing with alternate Broyles. You’re going to be able to see different aspects of people’s personalities and how they are. I mean, there’s obviously that great tension when it’s the quintessential spy on a mission kind of concept but we get to do in a way that fortunate for us I think fascinating because it’s the same person. J. H. Wyman: Not to mention we have one of the most unique potential love triangles in that its one guy with two different versions of the same girl. Q: Now getting to the alternate universe time travel kind of thing, for shows or films dealing with that it can get complicated very fast. Did you guys split the episodes that way to keep track of everything or was it just for story? So of course, the concept of, “Hey, we’re going to have the red credit sequence and the blue credit sequence” and we’re going to actually devise a way of telling two shows about one show for a certain amount of time in order to let our fans really experience over there as its own piece because the reaction that we got, that we received from our fans is more like, “We love the alternate universe” You know what, they like the weird things like the amber and the zeppelins. So we’re just sort of doling out these little packages of information over there in a way that Jeff and I both felt was palatable to somebody that would want to follow the story and actually invest in it and let their imagination get away with them without worrying about tracking of it the “Where am I now? What’s going on?” So it just sort of was a natural decision. We knew it was right, right away for us to tell more deeper, more profound stories without confusing anyone. J. Pinkner: We sincerely hold ourselves up very strictly to the confusion barometer. To us, our show is very much like a family drama masquerading as a science fiction show or as a procedural show and family drama, the theme of the story we’re telling, we want it to play against the big backdrop. We want it to be a story that a broader audience can understand and appreciate because we think the things that we’re talking about are universal and have great appeal. We’re not trying to tell a genre show that’s a cult hit like as much as like, yes, nothing would be greater than to have people passionate about our show, which is incredibly important to us. It’s something we’ve said before is not everybody likes licorice, but the people who like licorice really like licorice and we’re thrilled to be licorice. At the same time we honestly and sincerely show these stories to our parents and we say, “Can you guys follow this?” When they go, “Yes, totally,” we know we’ve hit it because we want to be a show that is accessible. Should people want to come watch we really want it to be welcoming and the way we figured to do that was to tell episodes over there. The concept, as soon as you see it, is really not that hard to grasp at all. There’s so many metaphors that apply or analogies that everybody understands. There’s like, “Oh, there’s the dream life and the waking life.” There’s daytime and nighttime. It’s the idea of two worlds, we didn’t invent it. J. H. Wyman: It’s not hard to get but the more accessible the show is the better it is and we realized early on that the science fiction becomes good when they become more about universal truths and morality and what’s its like to be a human and live here. The red licorice analogy is interesting because sometimes it takes a certain type of person to really say, “Hey, I like Sci-Fi.” We’re hoping that we get all those people because we love those people but we want to get those people that say the show is Sci-Fi when its aspirational to be Sci-Fi at its best where there’s real stories that are identifiable for people living here now. Q: This being a family drama, I guess we’ll be seeing a bit more of Peter and Walter who obviously had big problems last season and now they’re back working together. Can you talk more about what we can expect with those two? J. Pinkner: Last year what John Noble did with that character always left us breathless because he really transcended everything that we had written and he became so heartbreaking as a character. That’s a blessing and a curse at the same time because what happens is that played itself out in a way that we are very happy with—the breakup of Peter and Walter. So what becomes a challenge is how to get John and Josh to play something that we haven’t seen before and that got us thinking and that made us like, “Okay, how is this going to begin to resolve?” I say begin because it’s like if we really try to look at the relationship like a real relationship and when things break down in a relationship they’re not easily put back together. People have very strange feelings when they’re trying to reconcile. There’s so many difficult muddy, ugly things in a true father/son complex relationship that once we started looking at that portion of our program realistically we realized we had a lot to play. We realized that we could give John and Josh something to really chew on this year that’s different from last year but just another shade. So what’s going to happen is they’re going to be okay and then they’re not going to be okay. Then things are going to be solved for a minute and then further complications are going to pop up. Because the lie that was perpetrated against Peter and what Walter has done, if you take it for face value and you really look at it, it’s the quintessential kidnapping story. There’s feelings there. So this season we did say that the journey of self actualization for all these characters, this is a big part of it, this relationship and these people are going to come into their own. Peter is going to demonstrate things apart from his father for a certain amount of time but definitely emancipated emotionally and he’s going to self actualize and figure out where he plays into who he is and who he thought he was and all these things. Walter, by the same token, will do the same. He will get to the point where he realizes that he has to go through insanity to get to the place he needs to be okay. So we can promise there’s going to be some really nice drama between them and our impression of a real relationship and how those conflicts play out. Q: You guys have a lot of fun with the alternate universe; changing up the theme titles and having Olivia meet Bolivia face-to-face. Any fun stuff you have coming up like that: people meeting up and playing around with the format of the show and stuff like that? J. Pinkner: Yes, absolutely. One of the things that we love about the alternate universe is it’s an opportunity to world build. We spend a lot of time and attention and what’s been so wonderful to us is the level of attention and detail that all of our departments in Vancouver and all of the writers and all of the actors weigh in. Like everybody, the idea of what would our daily life be like? What would our universe be like? What would our world be like if certain decisions had just been made differently? One of the obvious being if the White House had been hit instead of the Twin Towers? If, as intentionally intended if the Empire State Building was a docking station for zeppelins and the Hindenburg had never exploded and people traveled via zeppelin, what would consequences flow from these things? If our universe had started to breakdown—now we’re getting more global—if our universe was starting to breakdown and the Bermuda Triangle was actually in the middle of New York Harbor and boats got sucked into vortex’s… The analogy for us is, if our world, if we were living in World War II like conditions all the time, what we looked at is that sort of tough times forge more noble, stronger people. So what would that universe be like? So everybody’s taken up the charge and those episodes that take place over there, the level of attention and detail shocks and delights even us. That our set designers and set dressers and art department get into. Now of course, from a character standpoint, we get to really spend time with a different version of Broyles. One who is still married and the consequences and how he’s different as a person. We get to really experience what Bolivia’s life is like. Our Olivia was essentially abused as a child. She was given these experiments which changed her worldview. Bolivia, that never happened to. Charlie on the other side is still alive and has a different life. So for our characters and for us, as storytellers, exploring these characters by which hopefully people in the audience will on some level think like, “Oh, what if I instead of breaking up with that guy back in college I had married him? What would my life be like right now?” It seems to us like Facebook is so much an opportunity for people to explore the choices they made and reconnect with people from their past and imagine how their life would be different or “What happened to this person?” It’s such a subconscious theme in our world these days that we get to play it actively through our show. J. H. Wyman: Part of your question I think is that we can say that members of our team will be aware of doppelgangers of themselves on the other side. So it’s not just going to be Olivia and Bolivia but you’re going to understand throughout the season and that’s going to be neat because that’s also as Jeff said, there’s something that we want to investigate. Imagine seeing a version of yourself that’s just a little better. That could be depressing. Q:Does Bolivia begin to see things a little differently on this side of the alternate universe? J. Pinkner: In the season finale Bolivia is charged with the notion that people from our side have invaded their world, have damaged their world and we are the enemy and Walter’s lying which is metaphorical is that they’re monsters in human skin. He doesn’t mean it literally; he means they’re the enemy. She’s now going spend time living with our characters, living with Walter, living with Peter, living with Broyles and just exploring our world and of course its going to affect her worldview. Of course. That’s one of the things that we’re really interested in. At the same time she’s an agent with a mission and she’s very loyal and dedicated to the life she’s living and to the people she works for. J. H. Wyman: Therein lies the conflict. Q: Will Olivia form any new relationships on the other side as she’s trying to work out her situation there? J. Pinkner: We love these characters that we’ve got to meet on the other side. Lincoln Lee, played by Seth Gabel is just delightful. We’re so thrilled to have Kirk Acevedo back. Lance Reddick is really playing two versions of Broyle and we had a conversation with him yesterday and it was odd because it really felt like we were talking about a character and not about a performer playing two different characters. It’s a unique situation where we have actors creating different characterizations of characters that they’ve already created. Walternate is so different from Walter but so understandable. His son was taken. It changed his worldview and it’s very much, but we get to see from the backend of the telescope how life events changed these characters. So Olivia will absolutely spend time interacting with all of them and that’s going to change her worldview as well. Q: Besides struggling with his relationship with Walter, it seems like Peter’s also struggling with the fact that this doomsday device is reacting to him. How much is that going to play into where his character goes this season? J. H. Wyman: It’s going to play a lot. Look, that’s a major thing. Last year, if you look at it again, it’s the season of secrets, it’s like subjectively Peter did not understand the secret. Everybody else knew and he didn’t know. So he’s had this huge revelation at the end of the season that gave us a lot of gasoline for the season for him. But now, that’s different. This season when he comes in he is now the person who knows more than anybody and wants more than anything to find out how does he fit into this. Why him? What does this mean? These questions become ultimately his core want: to figure out some form of answers that nobody on his team actually is qualified to answer. That’s going to be a big part of his self actualization. There’s a lot of answers that we think are compelling and mysterious and interesting this season that he’s going to start to put together a really nice sized jigsaw puzzle that will be eventful at the end of the season. J. Pinkner: One of the things that we’re really trying to attend to and that we both learned from experience as viewers and as storytellers is that MacGuffins, like the weapon, are only as important as how it affects the characters and how it drives them and changes their emotions. The other thing that we have found that works for us really well is ask questions but then give answers and then play the consequences of those answers. So the doomsday machine, we will explore it, we will learn more about it and what Joel was clearly saying is what we’re really interested in is how that’s going to affect Peter as a person. Q: It almost seems like Peter is doomed to be tragically unhappy for the rest of his life because first he finds out about Walter and now he’s got the whole Olivia thing going on. Is he ever going to find happiness? J. H. Wyman: Well, you have to go through darkness to get to light so that’s his journey right now. Just keep in mind when he first showed up on the team, this was a guy who was sort of rudderless and had absolutely no concept of who he was. He was a conman with very many personas and didn’t really commit to anything and didn’t really have substantial relationships in life that he could connect with. So if anything, I guess one could argue that he’s found a family, sometimes that he doesn’t want, but he’s found and has become a more dimensionalized human being. So in that journey, it’s like real life. Sometimes dark, terrible things happen and you have to move through them. They don’t go away very quickly. They actually form who you are once you pass through the other side. It’s a difficult journey, but once you get through the other side you come out at least stronger and more enlightened. I love a character, and I know that Jeff does too, that basically is trying to do the right thing but is having setbacks on an emotional level or on an intellectual level. He’s confused, but he’s trying to be a good person. He’s trying to do the right thing. He’s trying to get answers and trying to find happiness which we think everybody is today. Everybody goes through that so he’s sort of like this walking metaphor for us of people like, yes, every time you think you’ve got something great something comes around the corner and it can set you off balance and you have to deal with it. So that’s how we see him. I think that he’ll find happiness in increments and where they really count.